Tata Motors has unveiled the world's cheapest motor car at India's biggest car show in the capital, Delhi. The vehicle, called the Tata Nano, will sell for 100,000 rupees or $2,500 (£1,277) and enable those in developing countries to move to four wheels. The four-door five-seater car, which goes on sale later this year, has a 33bhp, 624cc, engine at the rear. It has no air conditioning, no electric windows and no power steering, but two deluxe models will be on offer. 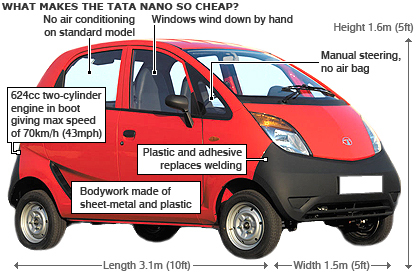 Tata will initially make about 250,000 Nanos and expects eventual annual demand of one million cars. The price will be slightly more than the 100,000 once tax and other costs are taken into consideration. The Nano release comes as India's domestic car market is predicted to soar in the coming years on the back of the country's fast-growing economy and increased consumer wealth. Indian car sales are predicted to more than quadruple to $145bn by 2016. 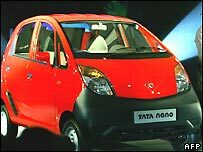 Company chairman Ratan Tata said the launch of the Nano was a landmark in the history of transportation. He said the car was "a safe, affordable and all weather transport - a people's car, designed to meet all safety standards and emissions laws and accessible to all". Environmental critics have said that the car will lead to mounting air and pollution problems on India's already clogged roads. But Tata said the car had passed emission standards and would average about 50 miles to the gallon, or five litres per hundred kilometres. The firm also said it would introduce a diesel version of the Nano at a later date. At the unveiling ceremony Mr Tata said: "I observed families riding on two-wheelers - the father driving the scooter, his young kid standing in front of him, his wife seated behind him holding a little baby. "It led me to wonder whether one could conceive of a safe, affordable, all-weather form of transport for such a family. "Tata Motors' engineers and designers gave their all for about four years to realise this goal. "Today, we indeed have a People's Car, which is affordable and yet built to meet safety requirements and emission norms, to be fuel efficient and low on emissions." Ravi Vangala, of Hyderbad, India, said: "I... congratulate Tata for his dream, and I will definitely buy the Tata Nano car." What price for Jaguar and Land Rover? Could India make Jaguar a success?